The pioneer of the fleet, derived from traditional New England shellfishing skiffs. Various choices of rig, including schooner! 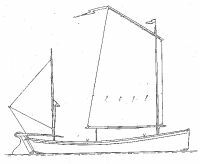 Like her working ancestors, Oystercatcher has a stiff and stable flat-bottomed hull with a jaunty sheerline and boldly-raked transom. She has the qualities which made a successful working boat, combined with the benefits of modern lightweight construction and easy maintenance. 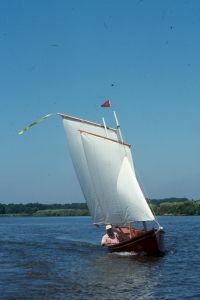 Her lines give her good performance under sail or oars, and if necessary a small outboard motor can be mounted on the transom. The well-rockered bottom allows her to carry a heavy load and still tack quickly and cleanly. The pivoting centreplate is actually offset to port, giving maximum unobstructed interior space and simplifying construction: the endplate rudder enables her to sail in a few inches of water. Hull construction is from two sheets of 3/8″ (9mm) and three sheets of 3/8″ (6mm) ply, with solid timber for framing, gunwales, etc.